She also claimed the people were well aware that the BJP raked up the Ayodhya issue at election time for the sake of votes. LUCKNOW: BSP president Mayawati today asked the BJP and Congress to desist from politics over the Ayodhya issue and leave the matter concerning the hearing of the case to the Supreme Court. "The issue is with the Supreme Court and it should be left to the apex court as to when and how the hearing has to be held and when and what verdict it has to deliver," Mayawati said. She was referring to the controversy over the contention of Sunni Waqf Board lawyer Kapil Sibal in the Supreme Court that the hearing of the Ayodhya title suit be deferred till after the 2019 general elections. "Both the BJP and Congress should not indulge in politics on this sensitive issue," she said. Mayawati also said the name of B R Ambedkar was invoked to influence his followers but the people would not any more fall into this trap. The BSP chief lashed out at the Uttar Pradesh government for cancelling the public holiday on the death anniversary of Ambedkar which fell yesterday. 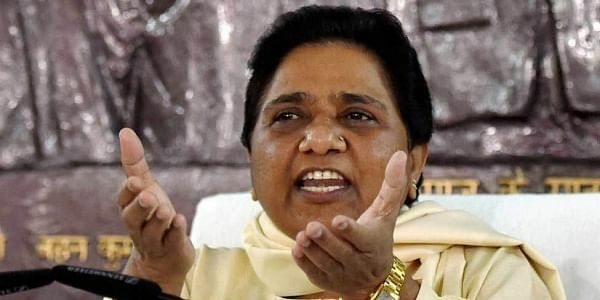 Warning her party office bearers and peoples representatives against taking law in their hands, Mayawati also expelled sons of Rajya Sabha MP Munkad Ali from the BSP forceful possession of a shop and troubling a Dalit shopkeeper. She also warned party office-bearers and elected representatives against taking the law into their hands.